Seychelles Flights from £531 at Qatar Airways Seychelles is known for its amazing landscapes and beautiful beaches. Make it more affordable by booking flights with Qatar Airways. Bali Flights from £581 at Qatar Airways - London Heathrow Bali is known for its forested volcanic mountains and beautiful beaches. Make it more affordable by booking flights with Qatar Airways. Melbourne Flights from £762 at Qatar Airways - London Heathrow Explore more of Australia than just its capital. Melbourne has something for everyone, including arts and nightlife. 2,000 Bonus Qmiles with First Online Bookings with Membership at Qatar Airways Start earning Qmiles with Privilege Club membership and you'll get a bonus 2,000 points with your first booking! Bangok Flights from £501 at Qatar Airways - London Heathrow With flights starting from just £501, it is the perfect time to book a flight to Thailand. 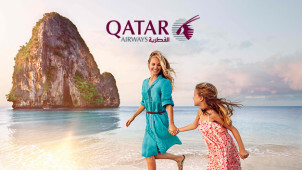 Maldives Flights from £2975 at Qatar Airways - London Gatwick Discover the wonders of the Maldives at Qatar Airways, and book a flight for just £2975. When you want to take yourself away, in style, you can rely on Qatar Airways. Providing customers with the ultimate experience in travel since its launch in 1997, this is one of the youngest, yet fastest growing and most renowned airlines around. A truly elite holiday provider, here you will only travel in confidence. With fantastic destinations on its books, with Qatar Airlines you can discover Indonesia, Doha in Qatar itself and much more. Whether you’ll be journeying around Europe on business, or exploring Asia Pacific on honeymoon - for groups, families, solo and business travellers - Qatar Airlines will have the perfect option for you. With a whole host of stunning hotels, exciting tours and attractions ready to book for less with Qatar discount codes, in the click of a button, you could be relaxing in Doha or even in one of their renowned airport lounges before you fly. Whatever you desire from your time away from home, let Qatar Airways inspire your next adventure. How do I use my Qatar Airways promo code? Your results will be displayed, as well as your discounts. Offers which don’t require a promo code will be applied automatically. Subscribe to the Qatar Airways newsletter and you’ll be the first to know about exclusive offers, new destinations and much more from this luxury airline. What is the status of my Qatar Airways flight? You can check your flight information for Qatar Airways via the app. What is the Qatar Airways baggage allowance? This varies between flights, starting from 30kg of hold luggage for economy class passengers. See here for the standard baggage allowances with dimensions. How can I spend my Qmiles? There are plenty of ways to redeem your Qmiles, from flight upgrades to even gifting others, visit the Privilege Club online for more information. How do I request disability assistance with Qatar Airways? Striving to cater to every customer’s needs, Qatar Airways will let you advise them during booking of any special assistance you or another from your party may require. This can also be requested under the ‘Manage Booking’ feature online. You will be emailed your ticket confirmations when you have completed your purchase. You can also access your bookings in the ‘My Trips’ section of the Qatar Airways website. If you’d like to cancel your booking, you can request a refund using the online form. Get in touch with your nearest Qatar Airways office, via the contact page. If you love to travel in style, don’t wait to book your next getaway with Qatar Airways. This is your ticket to experience the ultimate luxury service from an award-winning global airline. Plan your next adventure using a Qatar Airways promo code and save on flights, hotels and more. Connecting business and leisure travellers to 150 sought-after destinations around the globe, now you can take yourself away to Doha, Dubai, Australia and many more dreamy destinations for less. Qatar Airways operates a suave membership scheme and by joining the Qatar Airways Privilege Club, you can access a whole range of great benefits. With perks such as unlimited lounge access, priority check-in, extra baggage allowances and much more - it’s a no-brainer to sign up and start collecting those all-important Qpoints and Qmiles to get you going. Whether you're on a family programme or if you're a platinum member - there’s lots for all to enjoy with this loyalty scheme. When we’re to-ing and fro-ing across the globe, we choose the business class option with Qatar Airways to guarantee that our in-flight experience will be sheer bliss. A Qatar Airways discount code can make the price blissful too, when you know you’re saving on a spacious cabin, delicious cuisine, fantastic in-flight entertainment and renowned hospitality. With Qatar Airways, you can make that business trip enjoyable and even memorable for all the right reasons. Plus, when first-class and economy class cabins offer excellence each in their own right too, it's no wonder the Qatar Airways reviews are always exceptional.